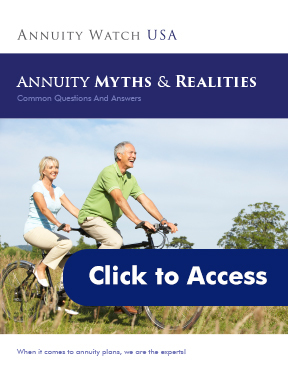 At Annuity Watch USA, we specialize in helping individuals and families understand various retirement income planning options that can help them create a more secure feature. One great option is the Fixed Index Annuity, a high quality fixed income product that provides you income for life –– income you can’t outlive. A fixed index annuity also offers 100% principal protection, tax deferral, and the ability to lock in gains based on the positive performance of the stock market.The reality is that fixed index annuities can offer many advantages. Unfortunately, there are lots of myths out there that cloud the message. We’ve put together this white paper to help clear up the misconceptions.